HERMISTON- Hermiston opened the season with a new coach and new tapa styled H helmets similar to the University of Hawaii. They also seemed to have a revised playbook. Hermiston started off the game by taking the opening kickoff and using a mix of passing and running lead by QB Faafialula Ena made it down to the WaHi 17 yard line. Following a loss of yardage and a penalty which left the Dawgs with a fourth and 17 on the WaHi 27 yardline Hermiston attempted about a 37 yard kick. It was short and WaHi took over on their 20. The Blue Devils junior quarterback Gary Winston used the running skills of senior Spencer Hessler along with his own runs to march down the field. WaHi scored on a run from the five yard line to take the lead following the point after of 7-0. 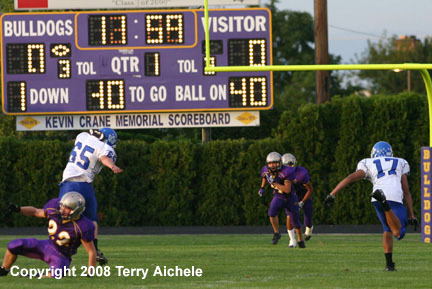 When Hermiston received the ball their play was hampered by a several penalty calls. 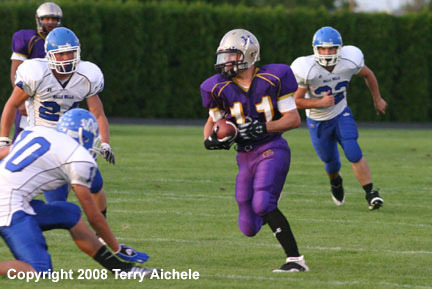 Ena used his runners including Tyler Green to work down to the WaHi 16 yard line when Hermiston had a fourth and four. Luis Ortiz hit the field goal to make the score 7-3. 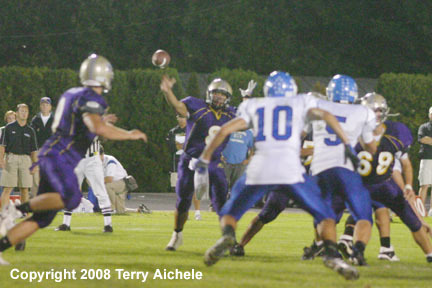 The WaHi quarterback Winston hit a long pass to the Hermiston 23 yard line just before the end of the first quarter. The second quarter opened with an unsportsmanlike conduct penalty against the Dawgs which gave the Blue Devils the ball on the nine yard line. Winston handed off to Hessler for a nine yard run to the endzone. With the good p.a.t. WaHi leads 14-3. A fumble by Hermiston gave WaHi the ball on the Blue Devil 39 yard line. A fumbled snap and penalty slowed down WaHi drive. WaHi ends up with a 4th and 25 and Matt Wilson in to punt the ball. Hermiston's Ena used the pass catching of Luis Ortiz and running of Tyler Green to show that the Dawgs could move the ball and get across midfield. Things were going pretty well when a pass was intercepted. With 43 seconds to go in the first half Hermiston took possession of the ball on their own 39 yard line. Ena made a couple short passes out to the left side to move a little way down the field. 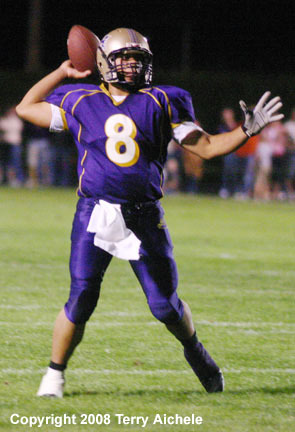 Then Ena hit a ten yard pass to Cody Humphrey. Then came a pass to Anthony Montez good to the Blue Devil 15 yard line. Then with about 10 seconds to go in the half Ena connected with Johnny Kayembe. The holding penalty against WaHi was declined and with the kick good, the Dawgs closed to 14-10 with under 7 seconds to play. The second half had Hermiston with several opportunities to take the lead. With 5:29 to go in the third quarter Hermiston had made it to the WaHi 4 yard line. The Dawgs used passing to Humphrey and Ortiz then running by Green. Unfortunately the ball was fumbled to the Blue Devils on a fourth and three on the three. With about seven minutes to go in the fourth quarter Hermiston defender Tyler Green intercepted a WaHi pass deep in Bulldog territory and runs all the way to the about the 40 yard line. The tough WaHi defense holds the Dawgs to a fourth and five on the eight yard line. The Dawgs attempted field goal is missed. 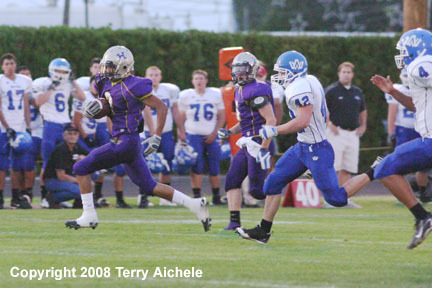 Hermiston was driving into WaHi territory with about two minutes to go in the game. The Dawgs were on the 25 yard line with a second and two to go when WaHi's Spencer Hessler picked off an Ena pass. LEFT - Hermiston's Luis Ortiz takes the opening kickoff. RIGHT - Hermiston quarterback Faafiaula Ena lets loose a pass during the opening moments of the first quarter. LEFT - Anthony Montez of Hermiston carries the ball after catching a pass from Ena during the Dawgs first possession. RIGHT - Anthony Montez tries to make his way past a WaHi defender. LEFT - Hermiston quarterback Faafiaula Ena lets fly with a pass during the Dawgs first series of plays on Friday. 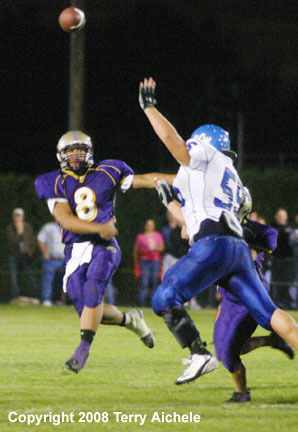 RIGHT - Hermiston quarterback Faafiaula Ena on a quarterback keeper. 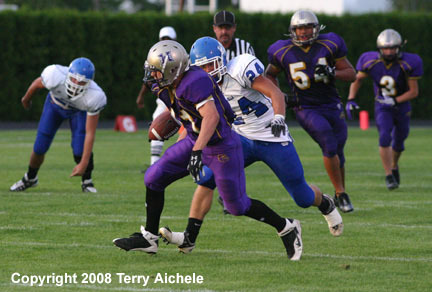 LEFT - Hermiston running back Luis Ortiz tries to find his way through WaHi defenders. 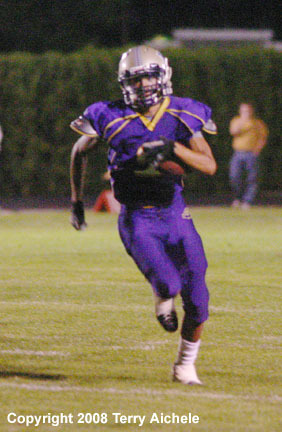 RIGHT - Hermiston running back Luis Ortiz gains a few yards during the first half. 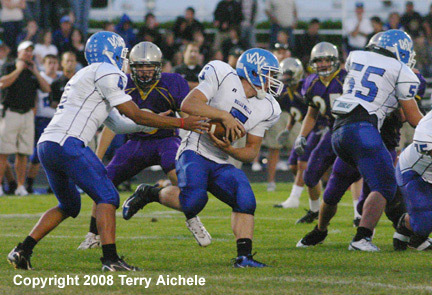 LEFT - Walla Walla Blue Devil quarterback Gary Winston hands off to Spencer Hessler who was the go to running back for WaHi during the Friday night game. 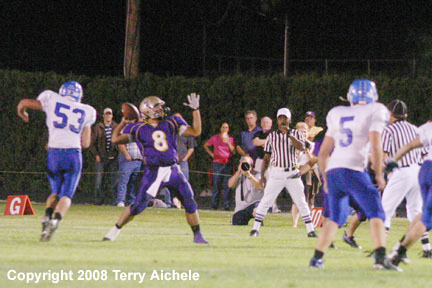 RIGHT - Hermiston quarterback Faafiaula Ena sets up to pass during the first half of the Friday night game. LEFT - Hermiston quarterback Faafiaula Ena lets fly with a pass during the Friday night game against the WaHi Blue Devils. 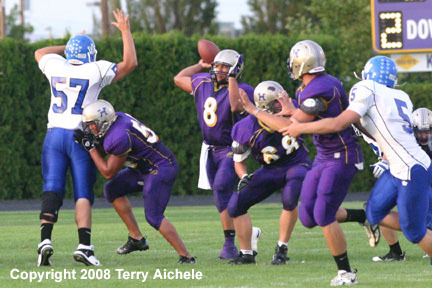 RIGHT - Hermiston quarterback Faafiaula Ena throws a pass to Cody Humphrey. 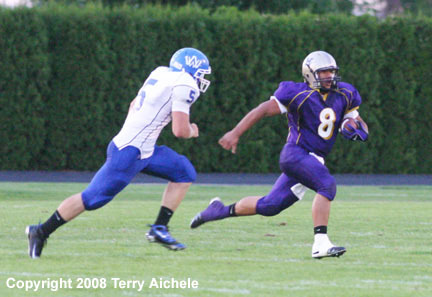 LEFT - Luis Ortiz, Hermiston wide receiver, running into WaHi territory. 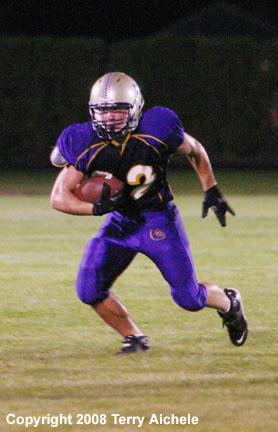 RIGHT - Ben Millard running back for the Bulldogs. LEFT - Hermiston running back Tyler Green, left carries the ball while Luis Ortiz backs him up. RIGHT - Faafiaula Ena attempts a pass during one of Hermiston's last scoring attempts late in the fourth quarter. 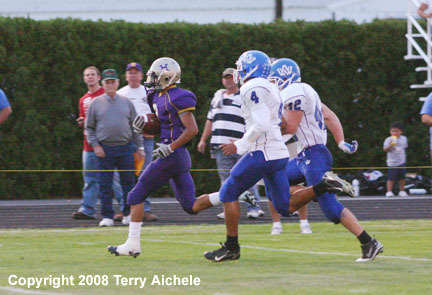 Faafiaula Ena looks for an open receiver during one Hermiston's last scoring attempts late in the fourth quarter.